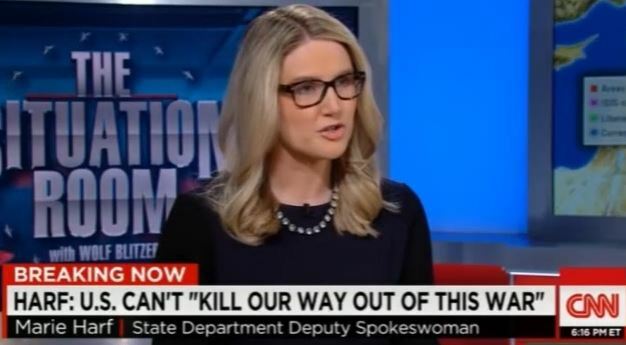 Marie Harf on ISIS: “We have to give them jobs!” Gotta Love This Administration! Marie Elizabeth Harf is the Senior Advisor for Strategic Communications to U.S. Secretary of State John Kerry at the U.S. State Department, leading the Iran nuclear negotiations communications strategy. Perhaps she should go to Syria and set up a job fair for Jidahists. See how long it takes for her to be in a cage wearing a red jumpsuit. via jobs4jihadis – Google Search. ISIS Formally Claims Responsibility – Releases NEW Threat Video, America Included! Police Ask Residents to Sign Pledge, Turn in Guns | Good Luck With That, Gun Grabbers!